You get an error that a sent mail can't be copied to the “Sent” folder, whereas the mail has been sent correctly. The problem occurs sporadically when you send messages via an IMAP server. The sent messages must also be transferred to the “Sent” folder on the server, which is sometimes a problem. 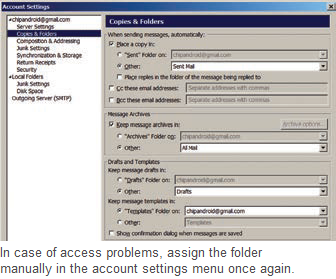 Usually, this problem can be solved by manually assigning the correct folder. Open the “Tools | Account settings” command. To the left, click “Copies & Folders”. The option “Place a copy in” should be activated. Change the option to “Other”. In the relevant combination field, select the mail account and “Inbox | Sent” in it. You can also select a different folder of the account or a local folder. Confirm with “OK”. If the problem is not resolved, click “Server settings” in the same dialog and then on the “Advanced” button. In “Maximum number of server connections to cache”, change the value to “1”. Confirm both dialogs with “OK”. This prevents collisions when accessing the server, but only one folder is monitored this way. You will have to increase this later.